Yes, I know, the 1970s are now the often-maligned decade that brought us dodgy celebrities and brown corduroy flares. It is hard to forgive such things. But one thing the 70s did know a thing or two about is sunstroke. How do you keep the sun off your overheating head? The 70s know. The 70s have it all figured out, and it has nothing to do with expensive sun cream or buying an overpriced straw hat from an itinerant beach salesman. The answer is the knotted handkerchief. I didn’t believe it either, until I tried it for myself. 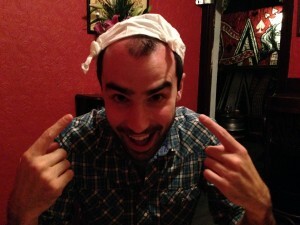 By simply tying a knot in each corner of an ordinary handkerchief (or, for those of us who are not Kev and do not own real handkerchiefs because it’s the 21st century, a paper napkin, which is what I used), the hankie is formed into a rudimentary hat shape that is readily applied to the head and which stays quite securely on, even in a moderate breeze. Plus, as you can see, it’s damned stylish. Note: other 70s beach fashions, such as plastic windbreaks and flashing, are not to be encouraged, and this knotted hankie revival is not intended to be an endorsement of those ill-advised practices. So far, following thirty years of your life, I think this may be the best photo anyone has ever taken of you. Ever. I think you might be right. Far from attempting to revive the knotted handkerchief as a central pillar of British fashion, I was actually just making this post so you would look at this picture of my face. This post will ensure that for months to come we will still be staring at your sorry-assed face in all its knotted headed glory. Yes. That’s more or less all I need to make me happy. YOU. It’s always about you, isn’t it? What about ME? It’s never about ME. What’s wrong with me (don’t answer that). I don’t know what’s wrong with YOU. I’m far too busy admiring ME. You know what, if I were YOU then I would be doing the same thing. Can you offer advice to all us without knotted hankies on our heads? Should we bow to public demand and follow suit or wander off on our own tangents, looking for The Next Best Thing? My only advice is that you get a knotted hankie on your head, and you do it quickly, so that you can resume looking at ME with as little delay as possible. I’m going to print out your picture so I can still keep looking at it whilst I’m tying up the knots in my hankie, so as not to lose any time whatsoever.